What’s the Point of Advocacy? Signs of weariness among some of the campaigners who first brought Darfur to the world’s attention. After six years of advocacy, of campaigning for an end to the conflict, there’s a moment of soul-searching. Nick Kristof, columnist for the New York Times, wrote the first article that catapulted the crisis into public consciousness. Now he is wondering where it all went wrong. Antonovs are in almost daily action. Millions are still crowded into the aid camps where malnutrition and disease run riot. There are continuing skirmishes between rebels and government. Expelled aid agencies are having to cave to Khartoum’s demands in order to return to Darfur. And President Bashir continues to gallivant around the Arab and African worlds in defiance of an International Criminal Court warrant for his arrest. To some extent, that’s a reflection on the Save Darfur movement and on scribblers like myself who took up the Darfuri cause. We have failed to foster the political will to bring about change. For all our efforts, the situation on the ground may soon become worse. A "Darfur fatigue" has set in, and the movement has lost its steam. And of course the movement was always compromised by its own shortcomings, from infighting to naiveté to the ubiquitous penchant of advocacy groups for exaggeration. He’s right and wrong in pretty much equal measures. Naivete and exaggeration have been the downfall of the Darfur movement. And Kristof more than anyone has been guilty of this – continally taling about light-skinned Janjaweed, for example. At the same time though the Save Darfur movement has done an incredible job of keeping Darfur on the political agenda. The issue was featured in US Presidential debates and Obama has appointed a Sudan envoy. The advocacy movement has even achieved its two main goals – UN peacekeepers and an ICC arrest warrant. The advocates have been incredibly successful. The problem is that they have been pushing for the wrong solutions. If the likes of Kristof are having second thoughts then this can only be good for achieving peace in Darfur. 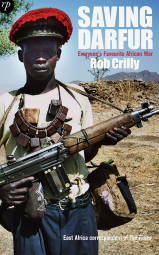 This issue is one of the main themes of my book, Saving Darfur: Everyone’s Favourite African War, due to be published by Reportage Press in November.